In addition to these explicit statements made in the Book of Mormon, a careful reading suggests that others also travelled in Lehi’s party, or were at least encountered by his group. For instance, 1 Nephi 7:6 speaks of the two unnamed sons of Ishmael having “families,” suggesting grandchildren of Ishmael and his anonymous wife. Similarly, Nephi mentioned how the “women [of the group] did bear children in the wilderness” (1 Nephi 17:1) suggesting Lehi and Sariah had grandchildren in the wilderness, in addition to their sons Jacob and Joseph. Another possibility is that Lehi took unmentioned servants with the party into the wilderness. If Lehi was a wealthy landowner, as the Book of Mormon portrays him as being (1 Nephi 3:16, 22, 24), then it seems very likely that he also owned domestic servants, something attested in ancient Israelite households. All told, after calculating both the known and inferred members of Lehi’s party, John L. Sorenson reasonably concluded that between 40–50 people entered the boat that carried the group to the promised land. Additional textual clues also hint that the party encountered outsiders during their travels in both the Old and New Worlds. 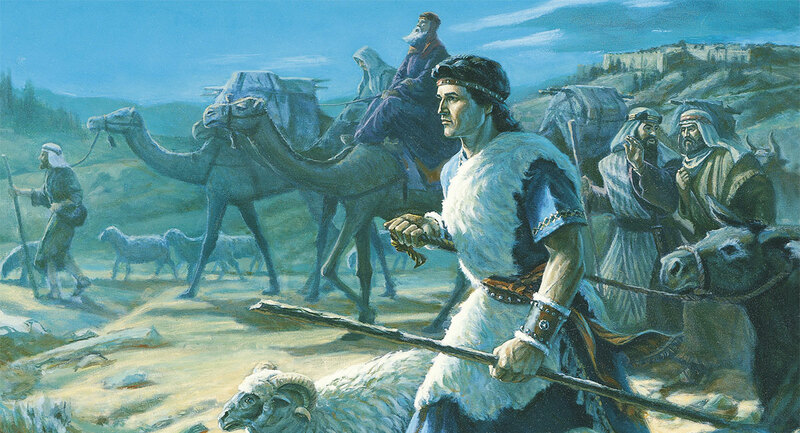 For example, Nephi’s use of the passive voice to describe Nahom (“the place which was called Nahom” [1 Nephi 16:34, emphasis added]) as opposed to the active voice used to describe the other locations visited during the party’s travels suggests that he learned the name of the area from an undisclosed third party (perhaps members of the local Nihm tribe). Given the staggering physical labor that goes into constructing seaworthy vessels, it is also possible that local inhabitants of the area called Bountiful by Nephi and his family assisted in the construction of the ship that conducted them across the ocean. Textual evidence also points to the high probability that Lehi and his family encountered native inhabitants in the New World upon their arrival who were adopted under “Nephite” and “Lamanite” tribal designations (cf. 2 Nephi 5:5–6). Understanding the composition of Lehi’s traveling party is more than just interesting trivia. Rather, studying this topic may help readers answer important questions about the Book of Mormon; questions such as whether the demographics reported in the book are realistic, as well as how Nephi’s small colony could have built a temple “after the manner of Solomon” with, as it appears from a surface level reading of the text, only a handful of people (2 Nephi 5:16). Reconstructing the size of Lehi’s group and exploring the possibility of unidentified “others” in the narrative are important for assessing the historical claims made in the Book of Mormon. Many readers today may wonder why more members of Lehi’s group aren’t mentioned by name. This is especially true for the women in Lehi’s party as well as the rest of the Book of Mormon. Who were these brave women who ventured out with their husbands and families into the wilderness? What stories might they have to tell? It’s certainly possible that more information about these women was contained in Lehi’s record–––a record which we unfortunately do not currently possess. Aside from ancient cultural factors which likely shaped the structure of the account found in 1 Nephi, Nephi’s decision to focus on specific narrative and theological details at the expense of others may also account for why he did not provide more information about his family (1 Nephi 6:4–6). It might also explain the mere indirect mention of “others” interacting with Lehi’s party. Whatever the case, carefully studying the given and implied details of the composition of Lehi’s family proves how rewarding a close reading of the Book of Mormon can be. As is true in many other instances, a careful analysis of the Book of Mormon narrative goes a long way in adding depth and nuance to an already remarkable text. It also sheds light on historical questions which might otherwise remain unanswered. John L. Sorenson, “The Composition of Lehi’s Family,” in By Study and Also By Faith: Essays in Honor of Hugh Nibley, 2 vols., ed. John M. Lundquist and Stephen D. Ricks (Provo, UT: FARMS, 1990), 2:174–198. Sidney B. Sperry, “Did Father Lehi Have Daughters Who Married the Sons of Ishmael?” Journal of Book of Mormon Studies 4, no. 1 (1995): 235–238. James E. Smith, “How Many Nephites? The Book of Mormon at the Bar of Demography,” in Book of Mormon Authorship Revisited: The Evidence for Ancient Origins, ed. Noel B. Reynolds (Provo, UT: FARMS, 1997), 255–294. For a historical reconstruction of the travel narrative in 1 Nephi, see S. Kent Brown and Peter Johnson, eds., Journey of Faith: From Jerusalem to the Promised Land (Provo, UT: The Neal A. Maxwell Institute for Religious Scholarship, 2006). As inferred by Hugh Nibley, Lehi in the Desert/The World of the Jaredites/There Were Jaredites, The Collected Works of Hugh Nibley: Volume 5 (Salt Lake City and Provo, UT: Deseret Book and FARMS, 1988), 40. There were at least two unnamed sisters who almost certainly married the two unnamed sons of Ishmael. See Sidney B. Sperry, “Did Father Lehi Have Daughters Who Married the Sons of Ishmael?” Journal of Book of Mormon Studies 4, no. 1 (1995): 235–238. John L. Sorenson, “The Composition of Lehi’s Family,” in By Study and Also By Faith: Essays in Honor of Hugh Nibley, 2 vols., ed. John M. Lundquist and Stephen D. Ricks (Provo, UT: FARMS, 1990), 2:192–193. See additionally Philip J. King and Lawrence E. Stager, Life in Biblical Israel (Louisville, KY: Westminster John Knox Press, 2001), 39–40; Lawrence Boadt, Reading the Old Testament: An Introduction, 2nd ed. (New York, NY: Paulist Press, 2012), 228–229. Sorenson, “The Composition of Lehi’s Family,” 195. E.g. the river of Laman (1 Nephi 2:8), the valley of Lemuel (1 Nephi 16:6), Shazer (1 Nephi 16:13), and Bountiful (1 Nephi 17:5). See Book of Mormon Central, “Who Called Ishmael’s Burial Place Nahom?” KnoWhy 19 (January 26, 2016). Located almost certainly in the coastal region of Dhofar in modern Oman. See Book of Mormon Central, Has the Location of Nephi’s Bountiful Been Discovered?” KnoWhy 259 (January 9, 2017). Sorenson, “The Composition of Lehi’s Family,” 194. See Book of Mormon Central, “Did Interactions with ‘Others’ Influence Nephi’s Selection of Isaiah?” KnoWhy 45 (March 2, 2016); “Did ‘Others’ Influence Book of Mormon Peoples?” KnoWhy 435 (May 22, 2018). James E. Smith, “How Many Nephites? The Book of Mormon at the Bar of Demography,” in Book of Mormon Authorship Revisited: The Evidence for Ancient Origins, ed. Noel B. Reynolds (Provo, UT: FARMS, 1997), 255–294, esp. 272–278. This was a concern raised by B. H. Roberts, Studies in the Book of Mormon, 2nd ed., ed. Brigham D. Madsen (Salt Lake City, UT: Signature Books, 1992), 259–261. For a reply to this inquiry, see Brant A. Gardner, Second Witness: Analytical and Contextual Commentary on the Book of Mormon (Salt Lake City, UT: Greg Kofford Books, 2007), 2:101–104; Mark Alan Wright, “Axes Mundi: Ritual Complexes in Mesoamerica and the Book of Mormon,” Interpreter: A Journal of Mormon Scripture 12 (2014): 81–82. See Camille Fronk, “Desert Epiphany: Sariah and the Women in 1 Nephi,” Journal of Book of Mormon Studies 9, no. 2 (2000): 4–15, 80; Donna Lee Bowen and Camille S. Williams, “Women in the Book of Mormon” in Encyclopedia of Mormonism, 4 vols., ed. Daniel H. Ludlow (New York, NY: Macmillan, 1992), 4:1577–1580. This has not stopped researchers from attempting to reconstruct the contents of the Book of Lehi as far as possible. See Book of Mormon Central, “What Was on the Lost 116 Pages?” KnoWhy 452 (July 24, 2018). See Book of Mormon Central, “Why Are So Few Women Mentioned in the Book of Mormon?” KnoWhy 391 (December 19, 2017). See also the observations made in Gardner, Second Witness, 1:3–4.